For many of you the joyous journey of becoming a US Citizen started with a K1 Fiancée Visa, a K3 Spousal Visa or through an Immigrant Marriage Visa and marriage to a US Citizen. From there you became a Legal Permanent Resident and eventually a US Citizen. 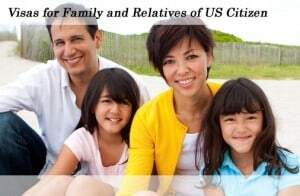 As a US Citizen, you can sponsor your parents, spouse and minor children to come and live with you in the United States as Legal Permanent Residents without any quotas, limits or priority dates. You can also sponsor other family members such as unmarried adult sons and daughters, and brothers and sisters, but with a wait. Whether you have to wait or not, as a US Citizen, rest assured, you can bring your family together again in the United States! As a US Citizen, getting an Immigrant Visa for a family member starts with the filing of an immigrant petition (form I-130). Once the immigrant petition has been filed and approved, the family member will have to wait to be assigned a visa number before the visa can be issued. A visa number is ALWAYS immediately available for the parents, spouses, and children under the age of 21 of US Citizens. Once approved, USCIS will forward the approved visa petition to the Department of State’s National Visa Center (NVC), where it will begin the visa application process. When the NVC has finished its work on your family’s application, they will forward the case to your family’s home Consulate for the visa interview. After the family member’s interview, the file will have a final name check and theimmigrant visa will be issued. Other family members and relatives who want to become immigrants are divided into categories based on a preference system. Unmarried adult sons and daughters of U.S. citizens who are 21 years of age or older. Unmarried sons and daughters (regardless of age) and Spouses of Legal Permanent Residents and their children. Married sons and daughters of U.S. citizens, their spouses and their minor children. Brothers and sisters of adult U.S. citizens, their spouses and their minor children. There is a limit on the number of immigrant visas that are available and issued every year for the second, third and fourth preferences above. This means that even if USCIS approves an immigrant visa petition for a family member or relative in one of the above preferences (2-4), the family member or relative may not get an immigrant visa number immediately. For this reason, in some cases, it can take several years before USCIS approves the immigrant visa petition and the State Department issues an immigrant visa number. U.S. law also limits the number of immigrant visas available by country. So, depending on the country where your family lives, you may have to wait even longer if you come from a country with a high demand for U.S. immigrant visas. Each approved visa petition is placed in chronological order according to the date the visa petition was filed. The date the visa petition was filed is known as your priority date. The State Department publishes a bulletin that shows the month and year of the visa petitions they are working on by country and preference category (see eligibility information above). You can estimate the amount of time that it will take to get an immigrant visa number by comparing your priority date with the date listed in the bulletin. For instance, suppose you look under your country and preference category, and see that the State Department is working on applications they received in May 1996. If your priority date is May 1998, then you may have to wait several more years for an immigrant visa number to become available. You may access the State Department Visa Bulletin at the State Department’s Website, or you may call the Department of State Visa Office at (202) 663-1541 (202) 663-1541, to learn which priority dates are currently being processed. Do to the wait times that are involved with the immigration of other family members and relatives, we require only $500 per petition to get started. Once a visa number has been issued, we will request the remaining balance to complete the visa service and take all necessary steps to insure that your relative can legally immigration to the United States.